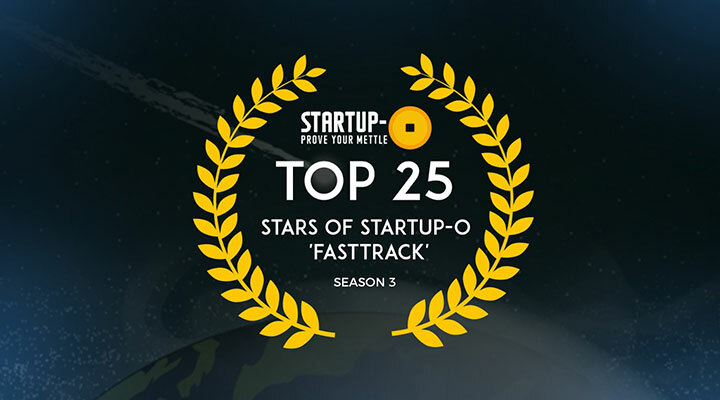 Congratulations to the Top 25 startups from Startup-O ‘Fasttrack’ May – June 2017 Season. These were shortlisted from among the 116 startups that registered for this season. Final 59 startups participated from across 12 countries and 10 tech categories. uce the cost of a satellite mission by a factor of 10. We develop in-space propulsion systems for satellites. We aim to be leaders in unmanned aerial vehicles for defence. We aim to develop orbital launch vehicles and satellites for the nanosatellite category. We have developmental order from ISRO for its propulsion systems and working with Indian Defence Department on the development of long-range UAVs for military applications. We help healthcare providers who face challenges in having a well-trained healthcare workforce by offering an eLearning and gamification learning platform that allows them to offer standardized and scalable on job training to nurses and paramedics. Bodhi is working on creating tech based solutions and more engaging forms of content on one hand and creating tools for better management of human resources by healthcare chains on the other. Thus, this becomes a comprehensive solution for sourcing, training and retraining of talent. Unlike our competition, we are a technology based medical education company offering an anytime anywhere training solution. We enable fast integration of industrial machineries or sensors to the Internet and cloud, allowing remote data collections to become easy and seamless. Our proprietary protocol is to achieve bandwidth efficiency, error-free data transmission and cost-effectiveness. We provide Data Loggers to bunkering mass flow meter system and get referrals for remote marine fuel monitoring service. We focus on the subscription and set up fee. Brightree’s E-logging is a key process and we are working with Marine Port Authority of Singapore (MPA) on this. We help children around the world who want to utilize the best method of learning by offering an online platform that allows them to practice the most effective method for knowledge retention – “Learning by Teaching”. Unlike our competition, we are safe, secure & accessible. We connect students and recent graduates with their dream jobs and internships. We have strong ties with top university career centers, government, and enterprises. We help students and recent grads to be career ready. Unlike our competition, we are specifically designed for students and recent graduates. We help hotels, restaurants & caterers (HORECA businesses) who procure grocery items, meat & poultry and milk based products in bulk by offering a one stop solution for grocery procurement that decreases their grocery spend by 5%. Unlike our competition, we are cheaper and have a wider variety of products. We help in providing end-to-end fundraising platform. We are a simple, smart & secure fundraising platform for corporate, social and personal causes. In Philippines landscape, we are the first & leading Crowdfunding and Whitelabel Fundraising Platform that provides SAAS CRM for NGOs. We are a Learning Platform for Teachers. Our entrepreneur model provides Video lectures, quiz, notes & tests in 14 subjects for Class 9th – 12th. Our analytics help any teacher to run blended courses. HungryBags.com, a travel tech & holiday bookings company, has launched India’s first completely online holiday search & booking engine powered by an integrated B2B marketplace. The platform allows users to book their holiday packages online – like flights and hotels. Our vision is to create travel democracy & aggregate B2B2C holiday space. The platform aims to be a marketplace that is both disruptive and all-encompassing. A travel democracy, where everyone harnesses the power of the internet and everyone is a winner – customer, agents & suppliers! We help relocating people and interior lovers who want a nicely furnished home by offering an online interior design service that gives access to designers worldwide for a flat fee. Unlike our competition, we are the 1st in the SEA market, highly scalable and the only ones offering international designers. Inito provides Accurate medical testing and diagnosis on your phone. Inito identifies the fertile window by measuring two hormones in Urine (Estrogen & Lutenizing Hormone) to boost the chance of conception. Fertility prediction is the first test in the suite of tests Samplytics will launch. Unlike our competition, our product matches 97% with Gold standard, tracks 2 key fertility hormones and gives 6 fertile days, the test can be taken at home. Great UX with mobile app makes it cost efficient. At Leverage, we offer loans to start-ups and SME market by understanding their financial needs and by connecting them to right investors and lenders. Since we are processing loans online we can now disburse faster and more efficiently compared to traditional banks and other financial institutions. We are free, online, have no hidden fees and process loans in 1 day. We focus on the inefficiencies in the money markets due to over-reliance on intermediaries and provide an all-to-all marketplace where corporates, non-bank financial institutions, and banks borrow and lend directly to each other. The means by which we enable this is STABL, Short Term Agreement for Bilateral lending, a financial instrument. Through STABL, we are providing an alternative to existing solutions, such as Commercial Paper, Overdrafts, Deposits and Money Market Funds – because the costs/returns of these solutions have been adversely impacted by regulations. It means that corporates, non-bank financial institutions, and banks can improve their yields for their excess cash and they are borrowing to get broader access to an array of lenders at a much lower price. Logisure provides a technology-based intelligent urban goods transportation platform for connecting all resources (both tangible-vehicles, people, spaces and intangible-technology, knowledge) and enables their sharing locally; thereby making businesses more cost competitive and cities greener. Logisure has chosen the role of an integrator in the highly fragmented urban goods transport services market wherein large numbers of players are fulfilling the requirement of vehicles, technology, helpers, spaces, etc. – the Toodlo Motion Controller. The MATA Headgear is the world’s first headgear with integrated audio and Peripheral Diffusion. The Toodlo Motion Controller is the world’s first mobile motion controller. Unlike our competition, we are not just a new competitor; we are disrupting this emerging market with patented innovations. We easily build, Train & Deploy Machine Learning Solutions. We have neural net based, trained on >50000 ML Training Parameters and automated data-preprocessing solving the biggest bottleneck in Machine Learning. Thus, giving us the advantage to introduce new ML/DL Algorithm in no time. Unlike our competition, we have an interactive UI which makes it very usable, strong backend, we are very customizable and time efficient. We help students in discovering their unique potential to take well-informed career decisions in a scientific, accessible and affordable way by offering a technology enabled career guidance eco-system which leverages research and machine learning algorithms to reduce human bias that allows students to enhance their awareness about career opportunities and take a well-informed career decision. Unlike our competition, we are India’s first real time career mapping platform which is collaborative and can be used by a stakeholder in the Ed-tech industry to help students in taking well-informed career decisions. We help beauty service businesses like barbershop, salon, spa, etc to simplify business operation, customer management, increase repeat visits and give their customers a better experience by offering an end to end platform and ecosystem that connects beauty service business with their customers through mobile apps and give them a single unified dashboard for managing sales, customer database, customer loyalty, and customer retargeting. Unlike our competition, we are one stop solution to manage the beauty service ecosystem. We help revolutionize emails into a work management software for people who have cluttered inbox, using disparate tools that lead to loss of productivity and increase in time, effort, and money and work. We help in avoiding work duplication by offering a personal mail assistant, a team collaborative tool, we automate email communication and work management that solves both email organization and work management. Unlike our competition, we are offering easy work transition, transparency, organized communication, adherence to standards, increase in productivity and capability of becoming a hub for all applications. We help parents who are looking for a “one-stop-shop” to buy Head2Toe dressing for their kids by offering a product line of pure and natural (chemical free), eco-friendly (zero wastage), functional and affordable ensembles that are functional, stylish, sustainable and durable for everyday wear and create an insatiable “need” for NeedyBee products. Unlike our competition, we are technology driven, operationally lean and efficient; the only brand in this segment providing a complete Head2Toe dressing for kids (0-5 years). We help urban Indian women between the ages of 25-49 who are looking for trendy, off the runway styles that are good yet highly affordable by offering a go-to destination for fashion jewellery that offers ready to ship styles and customizable jewellery options. Unlike our competition, we are disrupting the traditional supply chain by owning less inventory and working on a made to order model. No Player except Dave.AI uses an AI-based multi-pronged technological solution. We help Offline Retail and Service businesses who want to get their customers to refer more friends to their business by offering a Referral Marketing System that makes it very easy for their staff to implement a referral program and very easy for their customers to share with their friends. Unlike our competition, we are built for offline sharing, simple & easy to use for all levels of staff & overall a more cost effective marketing solution as compared to existing marketing solutions. We help small and mid-sized businesses and organizations who have a need for improving user experience and engagement by offering a customizable mobile platform that allows them to differentiate from the competition, retain and expand their user base. Unlike our competition, we are a unified platform for user engagement that can evolve as the business grows, with a low monthly subscription and no upfront cost. Urban Kisan provides an Urban Vertical farming solution that solves problems at all steps in the F&V chain. We grow in a controlled agricultural environment with RO-purified water as growth medium (no soil!) thus having year-round harvest which is healthy, nutritious and does not have harmful chemicals. We offer a full stack solution making it feasible to set up in cities, reducing wastage and by controlling the weather and temperature conditions we can produce more in less urban space. We have reduced the time from farm to table to less than a day thus ensuring freshness of our produce. Our hydroponic setup allows us to provide exotic vegetables locally at a much cheaper price than the usual market price.